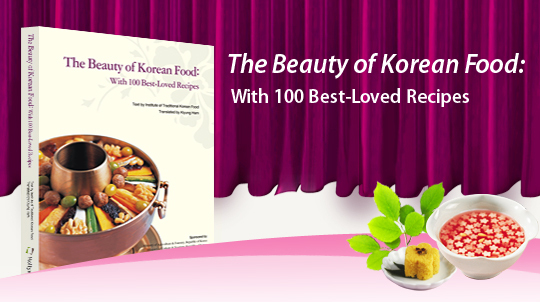 The Beauty of Korean food was created to share the secrets of Korean cusine worldwide, in 100 easy to folllow recipes. 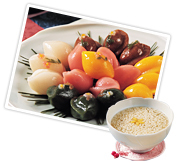 It was published as a collaboration between several government agencies, ‘Ministry of Agriculture, Food and Rural Affairs,’ the ‘Ministry of Culture, Sports and Tourism,’ and the ‘Institute of Traditional Korean Food.’ through the joint initiative, "Research & Development Project for the Standardization of Korean Food Recipes"
The recipes in the book use the SI system (the global standard), allowing for uniform measuring and delicious results, no matter who does the cooking. Recipes not only consist of colorful photos and step-by-step instructions, but are also accompanied by nutritional information and stories detailing the origin of dishes and their place in Korean culture. The book is a great resource for internationals interested in learning more about Korean food as well as those hoping to make their own healthy and traditional Korean meals. ‘The Beauty of Korea Food: With 100 Best-Loved Recipes’ is published by Hollym and is available for purchase at every major bookseller in Korea. Copies may also be purchased at select locations overseas.